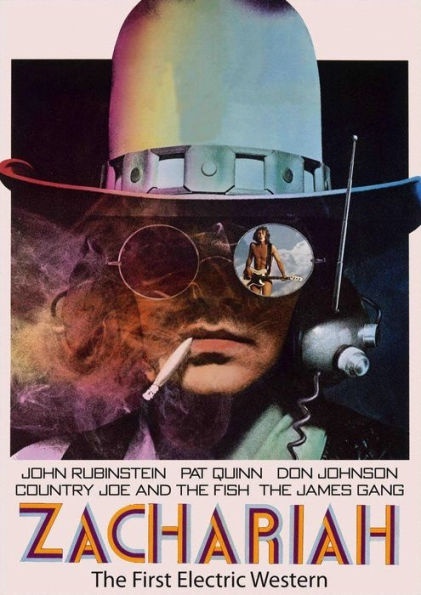 This western is permeated with the culture of the early '70s; it features contributions by writers for the Firesign Theatre, a counter-culture comedy troupe of the period, as well as music from groups such as The James Gang, Doug Kershaw, White Lightening and others--a rock/folk/country fusion. With highly stylized sets, music and story, this movie is full of surprises. Don Johnson as Matthew and John Rubinstein as Zachariah are two friends who go on the run. Together and separately they explore life as outlaws, at first enjoying and later being repelled by the reckless violence involved in gunfighting, bank robbing, and the other kinds of mayhem which come from the outlaw life. Along the way, they meet up with guides and gangs of various kinds, from a troupe of traveling, bank-robbing musicians (Country Joe and the Fish), to the greatest gunfighter in the world. Their paths diverge until Matthew comes gunning for Zachariah in a dramatic final confrontation.